Walls made with our log siding look like hand-crafted log homes because we make our log siding by utilizing an un-milled round side of a sawlog. This contrasts with most producers, who simply shape a curved surface into one side of a regular 2x8 or 2x6 by running it through a planer. Because the visible side of our log siding has never been through a saw or a planer, it has the slight variations in thickness and contour that a hand-crafted log wall has. 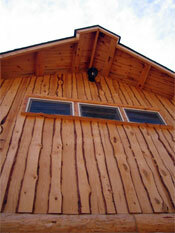 We pull the bark off the round part of the log siding using hand tools to preserve the authentic look of real logs. 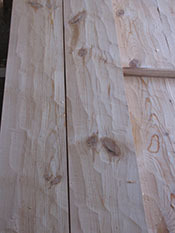 We recommend log siding which is 8" high, and we can supply it in lengths up to 16'. It's up to 3.5" thick at the center. 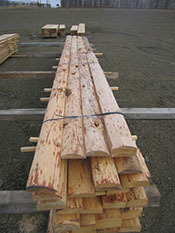 The price for 8"-high log siding is $2.75 per linear foot. That equals $4.10 a square foot. 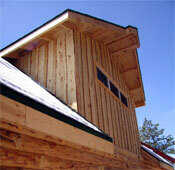 We can give you advice on how to install the log siding and how to handle windows, doors, and corners. We create our Swiss Batten siding by placing wide planks vertically, then covering the seams between the planks with smaller, half-inch thick, un-edged boards. Note the hand-peeled window and door trim, and the heavy timbers on the roof. These are also available from Aker Woods Company. Zoom Here's a closeup of Siding with an adze finish. Zoom Here's the adze-finished siding installed. 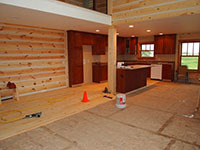 Yes, we supplied the flooring too. Zoom Note the differences in the thickness of the log siding. We recommend you grind away any visible flat surfaces after you install it.